Most kitchens are filled with “good idea” investments – those gadgets, tools and appliances that were a good idea in the store, but which collect dust most of the year because, let’s face it, who’s really going to scratch-make pasta, bread or Belgian waffles on a regular basis? In the bathroom, the equivalent might just be the tub. Scheduling a moment to draw a bath, let alone soak in one, is a near inconceivable indulgence considering that most Canadians work such long hours (almost two-thirds of us put in more than 45 hours a week on the job, according to a 2012 study). And with our aging population, tubs are increasingly trip-and-slip hazards rather than relaxation devices. In that sense, new survey results from Palo Alto, Calif.-based Houzz, an online, home-renovation community, are not surprising. Of the 7,645 Canadians and Americans who took the poll (all of whom either planning to or are currently remodelling a bathroom), 43 per cent said they are forgoing the tub, even in the master. Instead of deep basins, the high-end cleanse now involves glassy enclosures with ritzy finishes (slatted teak floors, for example), and a bevy of shower options – rain heads, steamers, massaging jets and hand-held spritzers. Liza Hausman, Houzz’s vice president of community, explains that “ I was initially surprised by the results until I looked more closely at what’s happening.” The trend, she continues, is based on two factors. One is space. Many people are upgrading, though not enlarging, their bathrooms and would rather have a capacious walk-in shower over a small shower and a tub they won’t use. The other is age. Homeowners 65-plus are the least likely to install a bath (59 per cent are opting out) because “getting in a freestanding tub can actually be quite tricky,” notes Hausman. Simon also suggests that the features of a shower are more customizable, and therefore more “exciting,” than a tub. The various independent controls can, say, turn on the rain faucet for a pleasant trickle as built-in wall jets pulse more forcefully at sore muscles. Like Simon, Toronto-based interior designer Sara Bederman also notes that age is an important consideration when planning out a bathroom. Not just for the elderly, though, but for the very young as well. Another important consideration, according to Bederman, is resale. The absence of a tub listed on the real-estate feature sheet might look odd to perspective buyers and agents. This piece originally appeared in the Globe and Mail on Thursday, February 27, 2014. 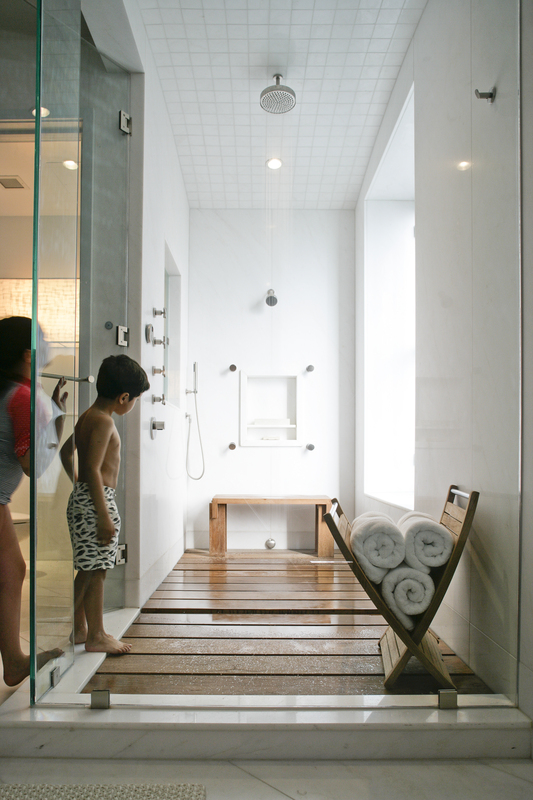 This entry was posted in Design Spy and tagged Bathtubs, Globe and Mail, Interior Design, Showers by mmhague. Bookmark the permalink.